The green, blue and silver work well together. The Angelo Grippo autograph is rightly included. The 1970s disco style writing that displays the flavor is not so good. Actually we will stop the bag review there because we have nothing else positive to say. Thick and firm Chips, which feature a hard, biting through, type break instead of a crispy, Potato Chips style crunch. It's a Crunch Test though, so it scales averagely despite the cracker hard chomp experience. Another darker colored Potato Chip from Grippo's. Again the potato slices are dominated by seasoning. It would be nice to say that a lot of this has been soaked up by the oil, but there is a secondary layer coating the surface. Most of the Chips were thick and flat. 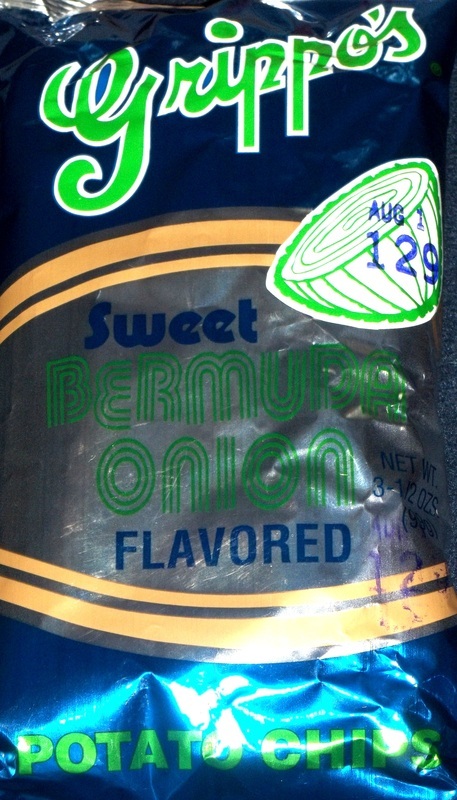 Maui Onion appears to be the Onion Du Jour for Potato Chips manufacturers (must sound exotic), but Bermuda Onion is a similar small and sweet onion, so it is there that we look for comparisons. These had a lot of seasoning so it would be hard to deny a flavor. It is a strong, somewhat potato overwhelming onion flavor, that fans will no doubt love. The Chips are very high in Trans Fats.